It’s hard to reach new levels of accomplishment both as an individual and as an entrepreneur. As we expand out of our self-imposed ‘comfort zone’ we can often find the greatest resistance in our minds. Recently, I took a challenge to record and post a video every day for 30 days. I’m thrilled to have made several videos despite the following three barriers that threatened to hold me back. Any one of these can slow you down and, when stuck in all three, you become paralyzed. I immediately started researching and looking for the best practices of producing videos. I started asking others for advice and planning what I would put together. My form of procrastination is not about being unwilling to work because I can get incredibly busy with a flurry of unproductive activities. Instead, it’s in planning and talking about what I want to do. And that’s where it can stop with no forward progress. I overcome my fear of making critical decisions by moving forward and not waiting. 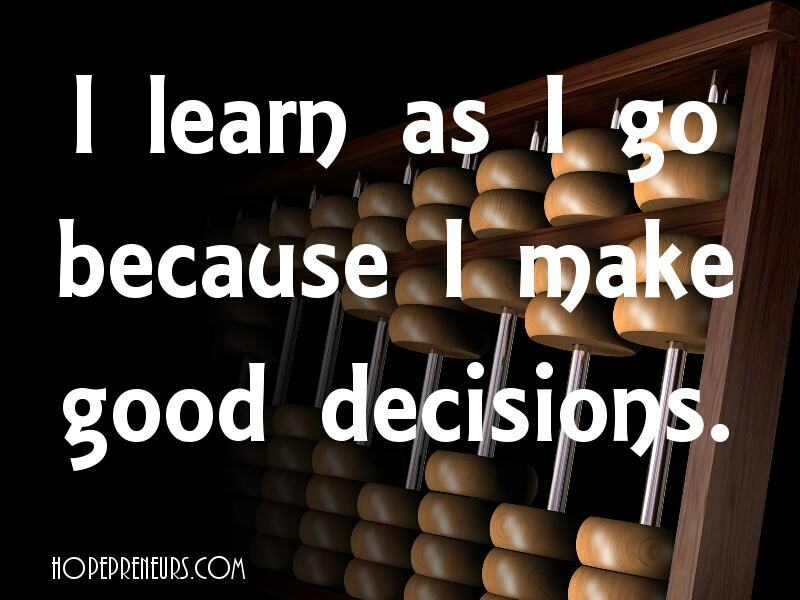 I learn as I go because I make good decisions. Confidence in taking the next step eliminates procrastination and encourages others to come along. It’s important to be aware of others. At the same time, it’s impossible to please everyone. In fact, if I’m not careful that can become my full-time job. When it came to recording the videos, I took the equipment that I had and started. The great part was I actually got great advice from others and most of it was positive. I care about what others think, yet do not let their opinions paralyze me and keep me from moving forward. Feedback from others helps to guide me in the right direction but does not set my course. Perfection is overrated. It’s a fictional state of being that can never be found because you can always find another reason why the project is not perfect. My satisfaction comes from progress and I learn as I go. I posted seven videos on my 30-day video challenge. That’s seven more than I would have created before I started. I had fun! I met some wonderful people who inspired and encouraged me. I’m glad I set aside my pathological procrastination, people-pleasing perfectionism. It’s thrilling to make progress. How about you? What project is laying on the side of the road due to this trilogy of barriers to your success? Go back and pick it up again. Dust it off and start heading in the right direction. Karen Sebastian is a serial entrepreneur who wants to help you succeed in your business. She is a certified facilitator with Kauffman Foundation’sFastTrac. Subscribe to this blog for more inspiration on how to become a HOPEpreneur. Please email her at hopepreneurs@gmail.com if you would like to book her as a speaker or want one-on-one coaching to accelerate your personal and professional growth. I am very excited to have a guest blogger for this post. Stacie Walker is an inspiration to anyone who might be ready to give up on building a successful business. Excuses are the number one reason people fail at building a successful business. During the early stages of building my business, I spent days riding the city bus to work at the public library because my electric and digital services were turned off. I could have used this temporary setback as an excuse to not take the necessary actions to create a thriving online business. That did not stop me from continuing with my plan and working my business. If a majority of people were in my shoes, they would have used this situation as an excuse not to continue to pursue their goals and dreams. During my first marriage, my ex and I were homeless for two weeks because we could not make ends meet, no matter how hard we tried to keep a roof over our head. I was scared about where I was going to rest my head everyday for 15 days but that did not stop me from continuing to build my business. Maybe you have been through a similar situation, maybe worse, maybe not. The point is that excuses kill your dreams and allow you to continue to live a life full of mediocrity. You deserve the things you long for and dream about, so it is important to overcome excuses and press on to carry out your deepest desires. Don’t be the majority that remains unhappy and tolerates a life they dread. 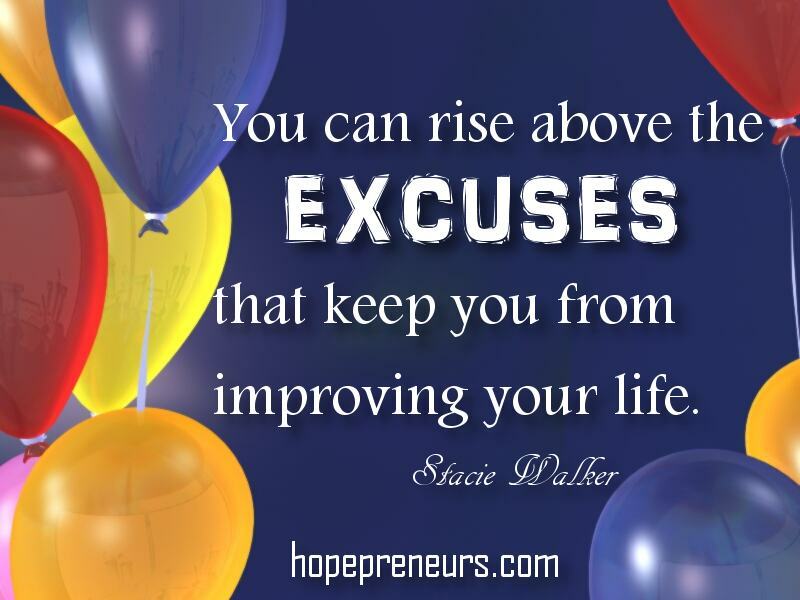 Stand up for yourself and rise above the excuses that keep you from changing your life for the better. The way for you to defeat your excuses is to take action by following three steps below. How Do You Triumph Over the Excuses that Destroy Your Ambitions? Sometimes we forget that brilliant ideas are born with a single thought. If you don’t write down what you want, then it is just wishful thinking. The very first step in keeping your dreams alive is to write down exactly what you want to carry out. All successful people, no matter their field of expertise, write down an organized plan to transform their goals, dreams, and desires into reality. 2. Develop the right mindset by constructing a library of materials that motivate and inspire you on a daily basis. I am aware that life can be busy and you may not be able to work on your personal development every hour throughout the day. Use technology to your advantage! Collect an arsenal of books, magazines, audio recordings, and video recordings to keep you in the correct frame of mind. A good strategy is to always schedule a set time to access your personal development materials. It is best to invest in your personal development before you get started for the day and then at night right before you go to sleep. I love to read books daily but when I wind down at night, I listen to an inspirational audio book. If you are not fond of reading, then you can listen to audio recordings or watch video recordings. Mix up your library of inspirational and motivational materials because they will help keep your excuses from slaying your dreams. 3. Stay focused on your goals by surrounding yourself with positive and successful people. Healthy associations are an important key to warding off the excuse “monster”. If you have not learned much from my past struggles, then take a look around. All across the globe, there are an abundance of successful people to inspire you. With the invention of the internet, it is easy to find positive and successful mentors. People who have been slung through the dirt and have experienced the nightmares of life continue to press on and go after their dreams. They can be people from the past, people you have not personally met, or people in your local community. Make the decision right now to take action and put any and all excuses behind you once and for all! Follow these three easy steps every single day. Whatever daily actions you perform, big or small will bring you closer to completing your goals. It really does not matter what you say after the “because”. You have already convinced yourself of an excuse to kill your dreams and deepest desires. Please do NOT give up and consistently take action by writing down what you want, access materials that motivate and inspire you, and surround yourself around positive people. The more challenges you encounter probably means you are extremely close to a significant breakthrough. Known as a success-driven entrepreneur, Stacie Walker adores working with professional leaders and entrepreneurs in the small business, home business, and online business industries. As the founder of Woman in Leadership, Stacie offers valuable business building advice, marketing strategies, featured success stories, financial education, and personal development advice to help improve the skill set of entrepreneurs in any industry. One of the reasons I like my Canon DSLR camera so much is that it has an ‘auto-focus’ feature. 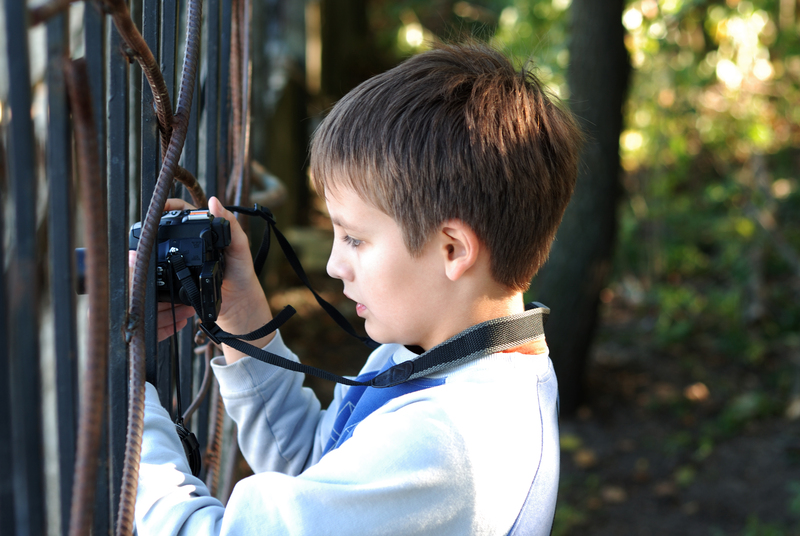 I turn the camera toward the subject of my picture, press half-way down on the button and it comes in to focus. It doesn’t take a long time and is easy enough for a child to use (which I appreciate). I want to apply this principle to my business. A well-managed blog is one of the most important pieces of your online networking. I’m normally an enthusiastic person who tackles projects with energy without considering a great deal of strategy. I’ve made a commitment to write a blog yet struggle to come up with topics. That’s where strategic focus becomes important. First of all, I need to talk about how challenging and exciting it is to come up with topics for my blogs and not dread the writer’s block that can set in when I wait until the last-minute. Secondly, I need to consider my audience and focus on their needs. Take time to get to learn about their interests. Engage them and set up relationships. Ask them for topics they would like to see covered. Pick a general topic and explore different parts of it. As you write the blog, focus on each part briefly and move on. Stop looking at what everyone else is doing and get going (for procrastinators). One of the best things about posting a blog is that you can make corrections if you see the need to do so (for perfectionists). Select a topic and focus on the different facets. The best part of all is that you will grow personally and your business will develop a stronger foundation. What do you plan to focus on this week? The few minutes you spend will pay off in the end. Karen Sebastian is a serial entrepreneur who wants to help you succeed in your business. Please email her at hopepreneurs@gmail.com if you would like to book her as a speaker or want one-on-one coaching. Subscribe to this blog for more inspiration on how to become a HOPEpreneur. When facing a new challenge, it can seem like an insurmountable situation. Every time you try something new it will seem hard at first. If you are a perfectionist, you may resist moving forward when you are not sure of yourself. My hope antidote for this excuse is to think back on other times when I felt like something was overwhelming. With time, I became comfortable with the new skill and encouraged others to try it. Why should this situation be any different? It’s okay to ask for help. It’s okay if you’re unsure. The key is to move forward and take action. This excuse can become a self-fulfilling prophecy because at times, when I’ve tackled a new project, I’ve lost sight of all the other things that I need to do. This ‘all-or-nothing’ thinking is confining and holds me back. The best way to eliminate this excuse is to schedule my time and move forward systematically and not compulsively. Darren Rowse in Problogger writes about how perfectionism itself is a ‘time drain.’ He’s right about that. Determine how much time you are willing to spend and reward yourself when you stick to it. I have to face that, most often, I am the one making it complicated. This goes back to the saying, “If it’s worth doing, then it’s worth doing it right.” The flip side of that statement is that I’d rather not even start the project because it looks too daunting. Set a simple plan in place. Take a few steps. Laugh when you trip. Learn from your mistakes. Cheer yourself on as you tackle big projects. If you do this on a consistent basis you will be much better off. 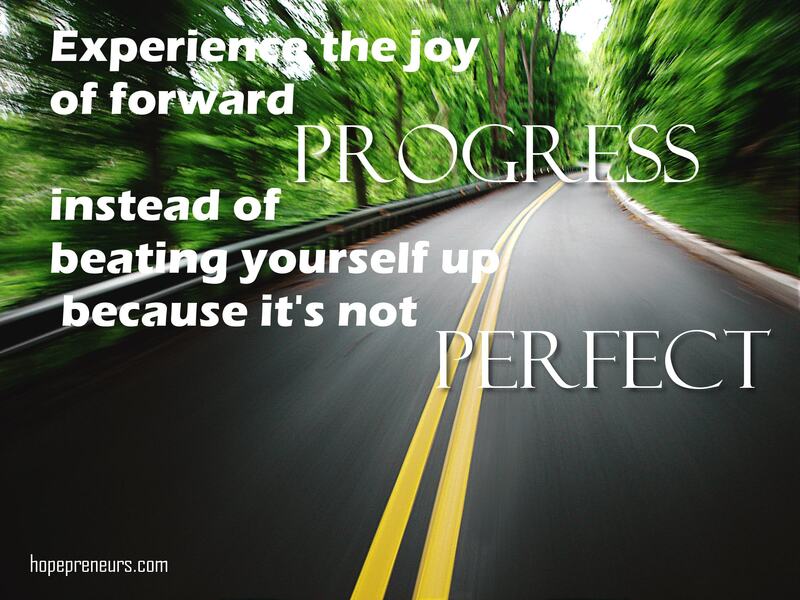 Experience the joy of forward progress instead of beating yourself up because it’s not perfect. What hope antidotes to perfectionism can you share? I would love to celebrate with you. How are you adjusting to the mandatory timeline on your Facebook page? I found it interesting to see the various ways that people handled it. There were two distinct extremes – those who jumped right in and those who resisted until the very end. Most of us fell somewhere in the middle. Let’s face it, we get in our comfort zone and like for things to stay the same. Here are 10 tips for embracing change (of any kind) since it’s clear that changes will continue to accelerate in the future especially in the technical arena. How do you respond when you facing change? Do you retreat and close yourself off or do you stay open and ready to move forward. Now this is really a tough one. We are always looking for ways to connect. With how many strangers have you talked about the awful weather? Avoid connecting on the negative implications of the change because that starts a pessimistic, hopeless way of thinking. 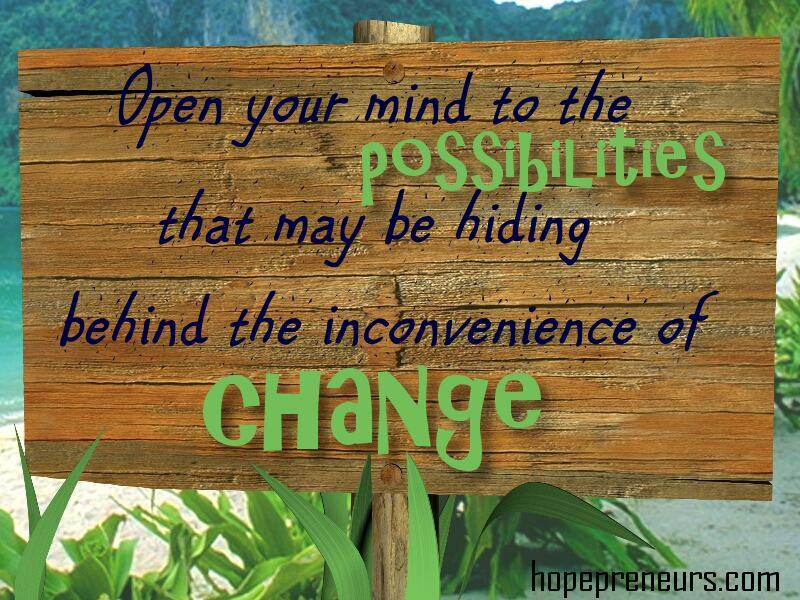 Open your mind to the possibilities that may be hiding behind the inconvenience of change. If nothing else, you are remaining flexible as you find out more details about the change. Creativity flows from solving problems. Take a step back and look at the negatives. See if others have come up with a workaround and if there isn’t, figure one out. Begin to share the benefits of the change. Be known for your positive approach to changes and not the outspoken critic of anything new. Stop procrastinating and dreading the change. Go ahead with it. It’s never as bad as you think it will be. Once you’ve made the change, look around to see if there is someone who was where you were just a few days ago. Encourage them to make the change or, better yet, show them how easy it is to do. In the first few days, the change will seem unfamiliar and awkward. Resist the urge to complain. It won’t take you long to get used to it. There are hidden opportunities that those who are resistant to change will ignore. What changes are happening in your industry or world? If you follow these steps you will quickly become an expert and authority. It’s not that hard, yet you will need to get out of your comfort zone. That’s what successful entrepreneurs do well. What changes are you going to embrace this week? 1. Get up and do some jumping jacks. Nothing gets the juices going better than to start moving. Walk around the block. Make this part of your routine. Instead of putting your head in your hands, jump up and down a few times. However, be aware of those around you, as they will have proof of your insanity. Smiling will drive people absolutely crazy and they will want to know what you are up to. Keep them guessing. The interesting part about facial expressions is that they telegraph your body that you are okay. I smile a lot when traveling because it is what I can control. When I get on an airplane, once I get to my seat I sit back and relax. I will close my eyes and encourage the corners of my mouth to go up in a smile. It works for me! This can be very scary because you love your rut. You’ve grown comfortable in doing things this way. Well, it’s not working. Shake things up a bit. What do you have to lose? Stop playing it safe. Stop doing what those around you are doing. Put a different spin on it. You know you’re doing what needs to be done if you feel uncomfortable. The point is to get out of your comfort zone. I can feel overwhelmed when I think about all I have to do. I start too many projects at once and have too much rattling around in my head. That’s when I need to get it down on paper. I get my timer and set it for 5 minutes. Then, I draw a circle in the middle of the sheet of paper and start drawing lines out from it. There’s no right or wrong way to do this. I just need to get it out of my head and in a place where I can look at it. This works for me every time. What do you do when feeling pressure? I like to laugh. 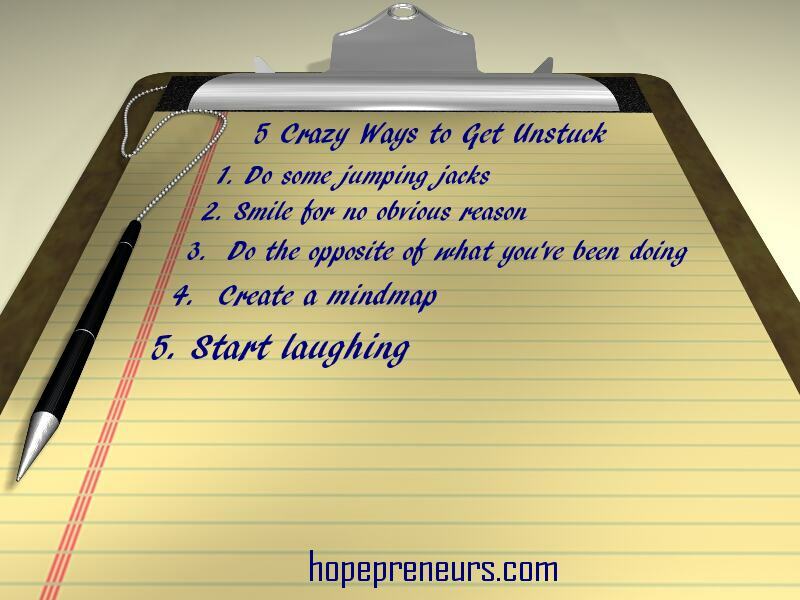 The quicker you find humor in difficult situations, the sooner you will make progress. I am always looking for stories for my speaking engagements and blogs. I look for parallels, remember past struggles and rejoice in ways I’ve overcome. If nothing else, I say to myself, “This is going to be a great story one day.” And it always is just that. 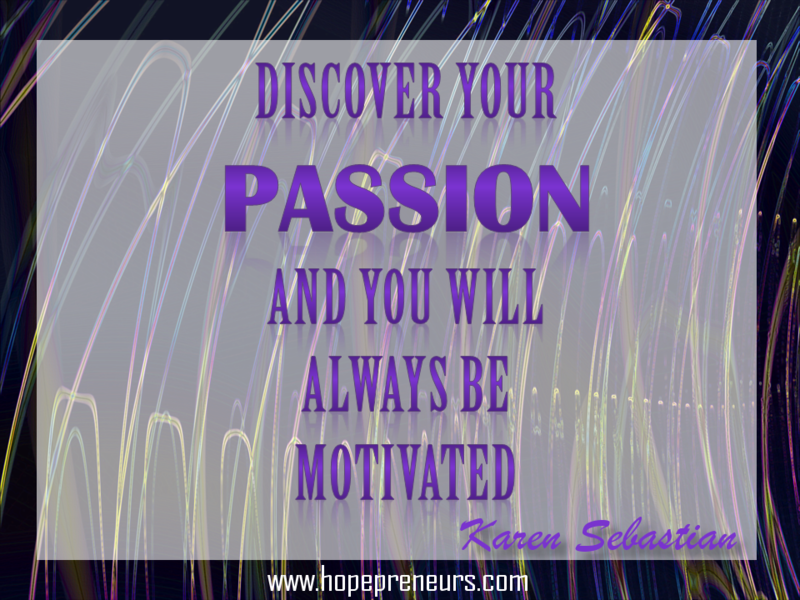 Karen Sebastian is a serial entrepreneur who wants to help you succeed in your business. Please email her at hopepreneurs@gmail.com if you would like to receive one-on-one coaching. Subscribe to this blog for more inspiration on how to become a HOPEpreneur. What’s your motivation quotient? Was it a great week full of accomplishments or were you struggling to get through the days? Did you take on too much as you started the new year? For the sake of this topic, I would like to give the HOPEpreneur definition of the word motivation: the internal drive to carry out what is important to us. It is closely aligned to what motivates us and what we are passionate about. It is personal and will grow when shared with others who share our passion. 1. Tap into your true motivation. When we align our goals with what truly motivates us, we will find the stamina to follow through with them. For example, my passion is to make a difference in the lives of women entrepreneurs. As a result, I have found increased my motivation to write this blog as I hear back from readers who find it helpful. What motivates you? 2. Celebrate every step in the right direction. Set small goals that keep you moving forward. I set a goal of ten blogs and you are reading the eleventh one. Now I am going to write some blogs to have ready to go for when my travel schedule picks up next year. What’s a small goal you can set that you will celebrate when you accomplish it? 3. Accept setbacks as reality check points. Initially, I set my goal to write three blogs a week to get me established and build up my mailing list. I still want to do that but am happy when I can get two blogs out there. If I re-frame the setback, I see that this is not a failure but rather a reality check depending on my schedule. What milestones have you set in place to mark your progress? 4. Acquire an accountability partner. Find someone who will check back with you to see if you completed what you set out to do. This is the reason that organizations like Weight Watchers are so successful. Pick someone you trust and who will urge you to keep going if you get derailed. Who will you ask to celebrate your next accomplishment with you? Literally, get up and walk around when ready to stop. Avoid the temptation to go online because you can burn up time very quickly in that venue. Set your timer and go for a walk around the block. Put some music on and dance to your favorite tune. Moving releases endorphins which help the creative process. What’s your plan when you want to stop? Where are you going to walk? This sounds like such a ‘no brainer’ doesn’t it? When it comes to our stretch goals, most of us talk ourselves out of what we want to accomplish long before we give it a chance to succeed. I meet people every day who tell me that they are terrible writers. Start small and persist. Follow through and improve your writing every day. The best way to do that is to write. What do you tell others about that stretch goal you’ve set for this year? Read the comics or watch a funny movie. Go spend time with friends that share your sense of humor. The more you laugh, the more creative you will be. What helps you laugh? I, for one, have learned to laugh at myself and find many opportunities every day to laugh. Karen Sebastian is a serial entrepreneur who wants to help you succeed in your business. Subscribe to this blog for more inspiration on how to become a HOPEpreneur. Copyright © 2012 Picture Hope International, Inc. Need More Inspiration to Succeed in Your Business?